http://www.viximus.com/_Viximus/Photos/Raw/7203B4EF-7309-4947-901A-890BA095E1D6.jpg http://www.viximus.com/_Viximus/Photos/Raw/35007307-0219-4E0E-A8D1-B774A8B7C688.jpg http://www.viximus.com/_Viximus/Photos/Raw/E9479CF5-7CF3-4325-A7AC-9B7C5E81FD5F.jpg http://www.viximus.com/_Viximus/Photos/Raw/6C4C55C7-F6A3-40DC-923B-B180B6E1BB91.jpg http://www.viximus.com/_Viximus/Photos/Raw/4955E1C7-1800-4D97-A99B-44617C73B7D5.jpg http://www.viximus.com/_Viximus/Photos/Raw/54C538F6-BCA8-44DC-88E3-EA6B80F9C4FA.jpg http://www.viximus.com/_Viximus/Photos/Raw/6498392A-A496-4E88-8588-912F51B830A8.jpg http://www.viximus.com/_Viximus/Photos/Raw/BFB1DAE0-DBBE-480F-B682-37970EB5C945.jpg http://www.viximus.com/_Viximus/Photos/Raw/4B44939C-F091-44FA-A072-3C22F606E242.jpg http://www.viximus.com/_Viximus/Photos/Raw/00506B0B-782F-4597-85EC-254B7C8B3EA3.jpg Rita Hayworth lapsed into a semicoma in February 1987. She died at age 68 from Alzheimer's disease a few months later on May 14, 1987. A funeral service was held on May 19, 1987, at the Church of the Good Shepherd in Beverly Hills. 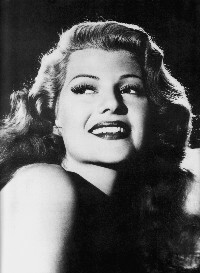 In 1941 Hayworth said she was the antithesis of the characters she played. "I naturally am very shy ... and I suffer from an inferiority complex." She once complained that "Men fell in love with Gilda, but they wake up with me." In 1970 she remarked that the only films she could watch without laughing were the dance musicals she made with Fred Astaire. Hayworth was a top glamour girl in the 1940s, a pin-up girl for military servicemen and a beauty icon for women. At 5'6" (168 cm) and 120 lb (55 kgs) she was tall enough to be a concern for dancing partners such as Fred Astaire. Hayworth got her big motion picture break because she was willing to change her hair color, whereas other actresses were not. She reportedly changed her hair color eight times in eight movies. The Alzheimer's Association Rita Hayworth Galas are held annually in New York City, Chicago and Dallas. 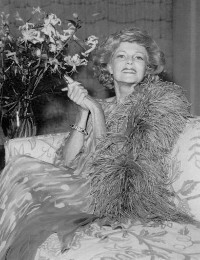 Fundraising events, they are named for legendary film star Rita Hayworth, who had Alzheimer’s. The galas are hosted by Ms. Hayworth’s daughter, Princess Yasmin Aga Khan. 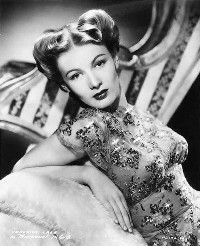 In 1948, at the height of her fame, Hayworth traveled to Cannes and was introduced to Prince Aly Khan. They began a year-long courtship, and they were married on May 27, 1949. Hayworth left Hollywood and sailed for France, breaking her contract with Columbia. Bebe Daniels was an American actress, singer, dancer, writer and producer. 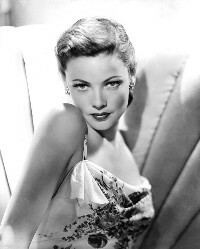 She began her career in Hollywood during the silent movie era as a child actress, became a star in musicals such as 42nd Street and later gained further fame on radio and television in Britain. 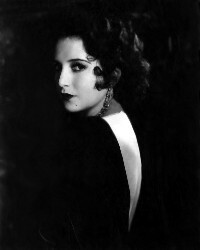 In a long career, Bebe Daniels made over 230 films. Goddard, who in her youth, missed out on an education because she had to support herself and her mother, bequeathed US$ 20 million to New York University (NYU). This was also in recognition of her friendship with the Indiana-born politician and former NYU President John Brademas. Goddard Hall, an NYU freshman residence hall on Washington Square, is named in her honor. Tierney's autobiography, Self-Portrait, in which she candidly discussed her life, career and mental illness, was published in 1979. 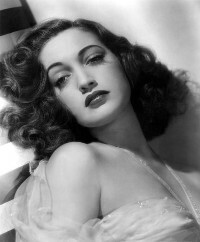 Lamour was the heroine of a novel, Dorothy Lamour and the Haunted Lighthouse (1947, by Matilda Bailey), where "the heroine has the same name and appearance as the famous actress but has no connection ... it is as though the famous actress has stepped into an alternate reality in which she is an ordinary person." 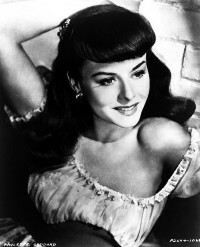 Lake was one of the models for the animated character of Jessica Rabbit in the 1988 film "Who Framed Roger Rabbit", especially for her hairstyle.